WE DO HAVE HIGH SPEED CABLE INTERNET AND FREE WIFI. And brand new Hot Tub installed March 19, 2019. This amazing custom home was designed and built for the actor Shephard Houghton and his wife in 1984. They would spend four or five months here each summer. In Shep’s memoirs he writes “It’s a beautiful home, with a view of sea and forest and [the public beaches in the Hoodsport area offer] lots of oysters, clams, shrimp, and salmon”. Shep appeared in silent films as a youngster, and went on to appear in such films as “Gone with the Wind”, “Showboat”, “Red Badge of Courage”, “Hello Dolly”, “Hindenburg”, and TV’s “The Mary Tyler Moore Show”, “Kojac”, and “Star Trek”, among others, before retiring in 1976. He was well-liked for his personality and work ethic and befriended quite a few Hollywood legends along the way. Framed posters of some of his work are hanging in the game house. There is just so much to enjoy about this house! Cook up a family meal in the large kitchen (while enjoying canal views), rest on one of the 2 large decks. Play pool, darts, ping-pong, or Donkey Kong in the private game house attached to the house. 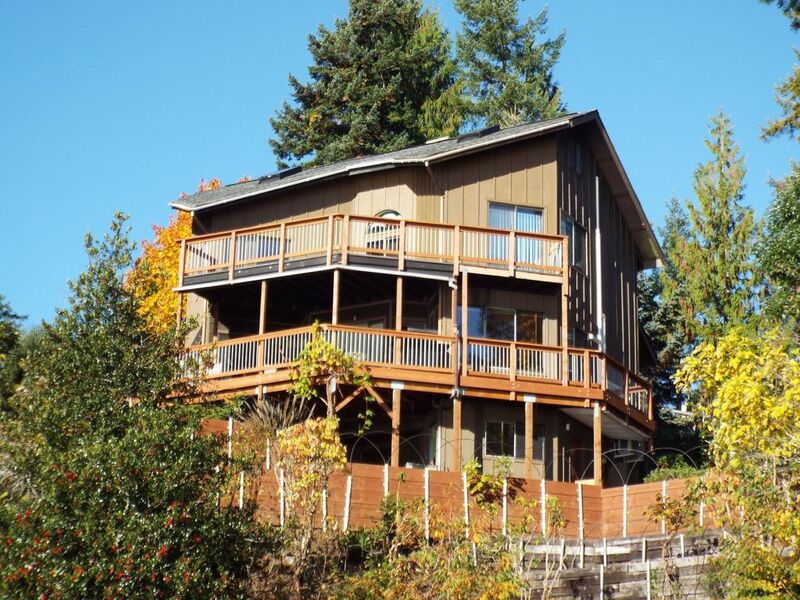 Or just explore the steeply terraced property to enjoy the wide open views of the Hood Canal. (There is a fig tree, plum tree, grape vine, and strawberry patches on the property, all offering fruit during their season.) Even the hot tub has beautiful views of the Hood Canal. Of course, the Olympic National Forest is at your door and Lake Cushman is just 5 miles away. There is hiking, boating, sightseeing, fishing (off-site), shellfish harvesting (off-site), hunting (off-site), shopping, etc., all within minutes of the house (but not in the neighborhood directly below the house). There are even a few popular Casinos just a short distance south on Highway 101. Looking to harvest shellfish? There are public areas just minutes away. Visit one of several local public beaches along the Hood Canal at low tide. Lilliwaup State Park beaches are just ½ mile away, and Hoodsport just 5 minutes away. Another shellfish harvesting area not far is beautiful Potlatch state park to the south. Local laws and ordinances must be observed. There is no shellfish harvesting available at the Deckhouse. The entire cove, beachfront and bulkheads, below our house is off-limits to harvesting and water access. This includes the bulkheads to the left and the crescent beaches to the right, as well as the tidewaters of the county park where the fire ring is. Kayaks can be put in from the rocky bulkhead of the small county park below the house. The master bathroom has a huge, elegant shower. The other large bathroom, next to the king size bedroom, has a huge bathtub with a removable shower head. The shower head can be used on the wall or held in the hand. The bathroom by the living room is a 1/2 bath. The bathroom on the ground floor is a 1/2 bath. Our home will sleep up to 12 people. Only the guests included in the original reservation are permitted on the property. Please review and understand the bed availability here. We want everyone to be as comfortable as possible. Some of the bed situations have limited privacy. There is a bedroom with queen bed, a bedroom with king bed, a loft with 4 twin beds, a full size futon on the ground floor in the office area adjacent to the washer/dryer, and a queen size sleeper sofa in the game house. The kitchen is large and well stocked with pots, pans, dishes, small appliances, blender, mixer, microwave, coffeemaker, dishwasher, etc. Guests provide their own food, although we do our best to keep coffee, creamer, and sugar in stock. We also supply the towels, shampoo, body wash, washer and dryer, laundry and dish detergents and beach towels. There is an additional charge per night for each guest over 2 guests. Only the guests included in the reservation are permitted on the property. My husband and I transferred to the Northwest from the East Coast in the 1980s and have loved living here ever since. Our labradoodle, Chester, loves to travel, loves the Deckhouse, the Hood Canal, the hiking. We are a family that loves to hike, camp, kayak...and travel! In Hoodsport these activities are practically right outside our door. Our dog, Chester, loves the woods and the water. Also, my husband is a general contactor and he and I both immediately recognized the appeal of this extraordinary custom home. I have also been open water scuba diving qualified (East China Sea, Okinawa) and should note that the house is less than 1/2 mile from the popular Octopus Hole scuba diving site and conservation area. What draws us to Hoodsport, in addition to the recreation, is the peacefulness and friendly people. This house is unique in the care taken in its custom design and its many artful touches. Two of the bathrooms boast of an assortment of custom hand made ceramic tiles selected by the Houghton's during their many travels abroad. AND, to top it off, there are just so many great things to do on the Olympic Peninsula. From the unexpected- such as antiquing up north in Port Townsend, to the hotly anticipated- enjoying shellfish at many of the fresh seafood haunts along the Hood Canal. Scuba dive at Octopus Hole. Boat and fish on the beautiful waters, or hike the breathtaking heights of the Olympic Mountains. Any way you have it, the Olympic Peninsula is great for all ages. toilet, shower, Private bathroom master suite. toilet, Bathroom is on ground floor near office area. unlimited long distance within the United States. Air conditioning on all floors, and in each bedroom. Heating on all floors and in each bedroom. Free unlimited WIFI. Roku Smart TV. Free WIFI. Free cable internet. We do our best to provide coffee, creamer, sugar. Often there are additional pantry items available but not always. We recommend guests provide their own food and staples. Dishes and utensils for 12. Plenty of glassware, serveware, dish towels, casserole dishes, etc. Large kitchen with pots, pans, small appliances, dishwasher, new refrigerator and electric stove. Also large island with double sinks and custom butcher block cutting board. A large round table which seats 6-8 people. Nearby is a seating area with a small table in front which can seat 4 people. There is also a large table with chairs on the deck outside. 4 ROKU Smart TVs. One in the living room, one in the game house, one in the master suite, and one in the King bedroom. The TVs have streaming service provided by cable, and also Netflix. Pool Table, Ping Pong table, Darts, Pokemon game console with 600 games, and a Roku Smart TV. The home contains many stairs and tight corners. Private outdoor hot tub with great view of the Hood Canal. We had a great time. Really enjoyed the game room with the pool table and ping pong table. Kept the kids entertained for hours. The hot tub was a nice touch. :) Would stay here again! This is a unique house. ALOT of character. Sandy was so helpful The gameroom is ALOT of fun. I would give this a 5 star but the hot tub is not there. We had a great time anyway. The house has everything u need. Clean, a lot of space and "Shep" Houghton may be connected to the house. We had a great time!!! Well, Julie, there is a brand new beautiful 6 person hot tub at the Deckhouse. The hot tub was not in the listing when you booked, was not added to the listing, nor installed, until March 19th, the DAY AFTER you checked out. You wrote your review today. I'm guessing you looked at the listing for reference when writing your review, saw the hot tub, and mistakenly thought it was supposed to be there during your stay. So, even though you loved the house and had a great stay you took off a star for a "missing" hot tub that wasn't supposed to be there in the first place. And your comment may lead people to believe I lied about the hot tub. Do you really think that's fair? Great home with tons of character. We really enjoyed our time at The Deckhouse. The house is so unique, full of funky and fun personality. We were in Hoodsport for a wedding so we shared the home with some friends. Its a fantastic place to host a group, 6 adults and 1 kiddo all had plenty of space for ourselves. The game room is a blast! The beds are comfortable, house is clean and well appointed and waking up to the views of the Puget Sound is something truly special. Sandy is prompt and very communicative and made sure everything was great for our stay. The next time we make travel plans to the area, we will be in touch to stay again. This property is Fabulous. !! The property is Wonderful. The layout of the house is perfect. The game room is just great. Back when I booked this timeframe, I had no idea that while there we'd get 16" of snow dumped on us. Thank goodness for the freestanding metal fireplace and abundance of firewood. This property and owner are 5star but with the storm of the decade, power outages and consequential periods of no internet and WiFi, I put it at 4 stars. But, we LOVED this home and the comfortable beds also. Would do it again. Went with a couple friends from college and we had a great time. The house was clean. The view is beautiful. The game room was a great size to keep all of us entertained. The kitchen was well stocked with the basics for cooking (if you really like to cook, the knives might be a bit lacking). We will definitely look to come back again in the future.